· La superficie no es fácil de oxidar. · Con cable flex plano para reparar el daño uno. · La cámara 4k proporciona una vista de alta definición. · El corte preciso se adapta perfectamente a su dron. 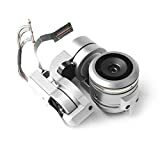 · Features:Made by superior material, it is reliable and sturdy.The surface is not easy to rust.With flat flex cable for repairing the damage one.4k camera provides high definition view.Precise cut fit your drone perfectly.Camera gimbal assembly is specially designed for DJI Mavic Pro.Descriptions:Exquisite workmanship provides long service life.It is a professional repair parts for DJI Mavic Pro.Compact and lightweight, portable to carry.Specifications:Material: alloySize: about 40x40x50mmColor: silverPackage included:1 x 4K camera1 x Pitch Motor Arm with cable1 x Roll Motor ArmNotes:1.Due to the difference between different monitors,the picture may not reflect the actual color of the item. We guarantee the style is the same as shown in the pictures.2.Due to the manual measurement and different measurement methods, please allow 1-3cm deviation.Thanks!